The WindWorks platform provides accurate wind speed & direction data at an affordable price. It includes an Inspeed Vortex wind sensor & electronic e-Vane. Both are provided with 25' of wire (more available as options). It also includes interface electronics with USB cable, and WindWorks software. Works with MAC or PC. All you need to provide is a means to support the wind speed and direction sensors up in the air (a pole or mount of some sort). NOTE: requires that the computer be on all the time for recording. 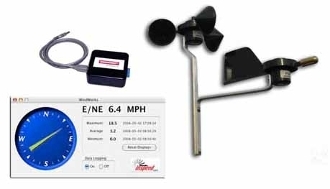 The WindWorks Kit includes everything necessary to collect wind speed data: a quality Inspeed Vortex Wind Sensor, an Inspeed electronic E-Vane wind direction sensor, wire, and interface cable. It is based on a powerful processing unit that has plenty of room for future goodies (like other sensors... on-board data logging...). To the right is a photo of the WindWorks Processing Unit with USB Cable. The blue terminal block is where to attach the sensors. Click Add To Cart to see options, packages, including sensors, wire length, and selection of PC or MAC software. Data Log On/Off: to start and stop data logging. Alarm speed : allows you to set up an alarm speed that will change the display when tripped. Auto Log Start: enables the software data logging feature whenever the computer is turned on - automatically. Direction adjustments: allows you to smooth direction data, offset it if the vane is not pointed in the right direction, and adjust the voltage for precision setting. Interval: the number of minutes between stored data sets. It is also the interval over which the stored wind speed will be averaged - in minutes. (Note: this is not the same average as the Live Display, which averages over the entire time since the live displays were last reset). You can input fractions of a minute if desired. Log to Internet : this feature allows you to stream live data to the URL of your choice. It also includes the capability to constantly update a live display at the URL of your choice. Read the instructions for more details. The data stored includes the current speed, the max and min during the previous storage interval, the wind direction, and the average wind speed over the interval selected.